One of Seattle’s efforts in slowing things down and getting everyone to share a street with cars has turned into a ticket trap. When Seattle converted four blocks of a car-crammed Belltown street into a parklike boulevard last year, the purpose was to bring a touch of slow-paced Mayberry to the big city. Well, we got some Mayberry all right. In the form of Andy and Barney handing out $124 tickets to befuddled motorists. The Bell Street Park is a “woonerf,” or living street. It invites cars, pedestrians and bicyclists to share a road space along with rain gardens, art and bench seating. By most accounts it has been a big hit with the Belltown neighborhood. 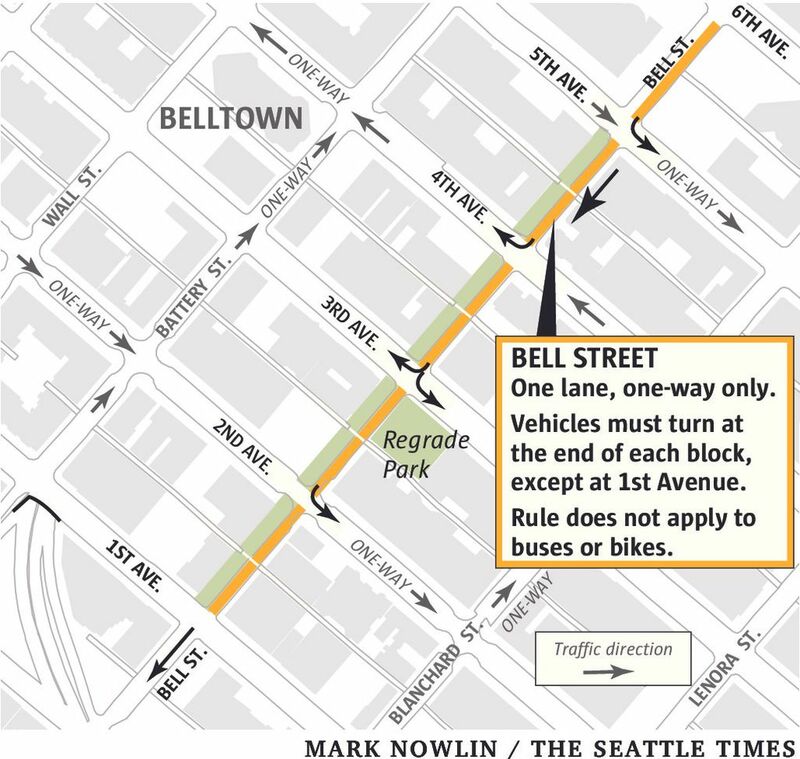 But last fall, the city concluded that too many cars were using the remaining single-vehicle lane of Bell Street between Fifth and First avenues. So it imposed a new rule: All cars and trucks must turn off the street at the first opportunity. To let drivers in on this one-block-only rule, the city installed signs at each intersection with an arrow pointing left or right along with the word “Only” (meaning that you’re no longer allowed to go straight on Bell to the next block). For whatever reason — it’s confusing? We all went to Ballard Driving Academy? — practically no driver seems able to navigate this woonerf without breaking the law. On Tuesday morning, as on many days recently, four motorcycle cops lined the street handing out tickets. “It’s the Bell Street shooting gallery,” says Bill Owen, a bicyclist who regularly uses the street. During a15-minute period on Tuesday, I watched 28 of 36 cars coming along Bell Street break the law by going straight. About half of those were ticketed by busy police. The drivers I spoke with seemed oblivious to what they had done wrong. “You learn something new every day,” one said, when told by police that he was supposed to travel only one block on the unusual street before turning off it. On some afternoons, Owen said, police could have ticketed nearly 100 percent of the drivers, who obviously don’t understand how to navigate a woonerf. Jeff Lee, who owns Two Bells Tavern near Bell Street and Fourth Avenue, said he thinks the city likes the confusion just fine. Because now the new park has become a major ticket trap. The city’s chief traffic engineer, Dongho Chang, said the purpose was to reduce car traffic through the new multiuse park. Metro also uses the park as a through street for up to 300 buses daily. Chang did not know immediately how many tickets had been handed out in the four months since the driving restriction. One problem is cryptic signs, which never spell out “cars and trucks must turn” or any clear instruction. Plus buses (and bicycles) are allowed to go straight through, so often cars behind them simply follow. Owen said if the city was interested in helping people it would simply put up blunter signs. Say, signs at midblock that read, “Warning: Cars and Trucks Must Turn Ahead.” As it is, drivers now believe they’re being gouged. Mission accomplished, though, on bringing back that small-town feeling. On Tuesday, the cars poking along never topped 5 or 10 mph. The four officers stood in full view in the street, smiling and chatting with passers-by. Car after car rolled right into their friendly ticket web. The old joke is that Seattle, deep down, is Mayberry with skyscrapers. No amount of skyscraper building seems to make that less true.